Yesterday I got up early, left the new house I'd barely settled into, and hit the road with the kind of overstuffed suitcase you pack when you'll be on the road for a couple of weeks and you aren't quite sure what you'll need to wear, and you'll be in three completely different climates during that time. I flew to Philadelphia and went to Rowan University in southern New Jersey, where I met photographer Kyle Cassidy (aka my friend Kyle Cassidy). We did a Master Class together, answering questions, talking about what we do and how we do it, and, at one point, reading stories and showing photographs from Who Killed Amanda Palmer. Then I gave a talk that was also a reading as part of the Rowan University Presidents' Lecture Series, that was as much fun as the talk/readings I did in Billings and Calgary, and the audience seemed to like it, and I loved how comfortable I'm starting to feel on stages in universities and such. I no longer feel, when I'm out on the stage, like I'm faking it, or that I'm there under false pretenses. It was windy. My hair does not normally try to escape. I look like I was living out in the frozen wilderness, where I was panning for adjectives or something else that wild writers do. 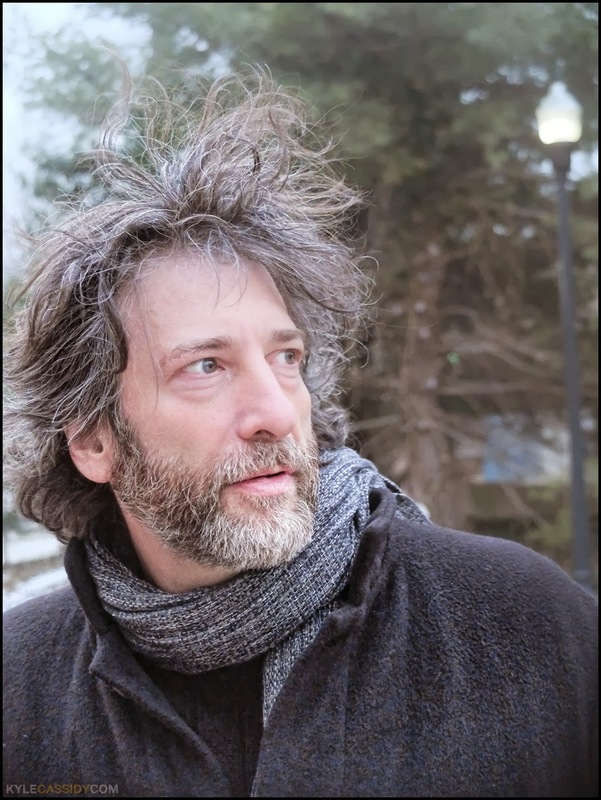 If you go to http://thedeanblog.com/kyle-cassidy-and-neil-gaiman-bring-the-creative-to-ccca/ and read about the day from the Dean's point of view, you'll see a photo she took of Kyle taking the bottom photograph. How unusually recursive. 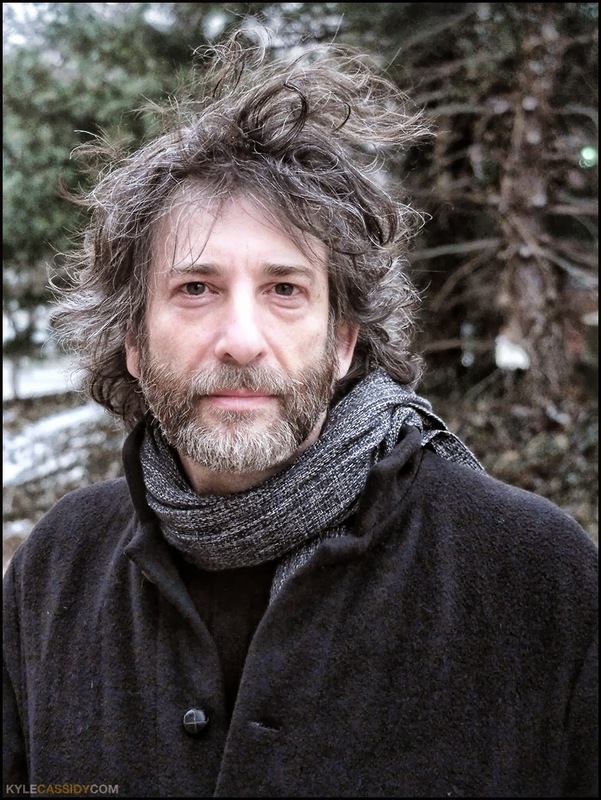 Then I flew to San Francisco (I finished Monica Byrne's lovely THE GIRL IN THE ROAD on the plane and also proofread the second GRAVEYARD BOOK graphic novel, and went over J. H. Williams' breakdowns for the third part of SANDMAN: OVERTURE.) It was a mostly quiet flight, although it was also the first time I've ever seen the pilot of a plane come out and explain to drunk and unpleasant passengers that if they didn't stop being unpleasant he would have them arrested. Let's see. Important things... apologies to Detcon 1, I'd wanted to post about their nomination process for their YA and Middle Grade Fiction Award, but I missed the deadline. The folk making the Wayward Manor video game have let me know that the pre-order site, http://whohauntsneil.com, is coming down in a week. So if you want to pre-order the game, the t-shirt, or even attend the pricy and exclusive but incredibly cool haunted Magic Castle dinner with me, you should click over to http://whohauntsneil.com/welcome/#shop and buy all the things with alacrity. Wayward Manor has just gone up on the Humble Store, where you can also preorder it, and it will remain there for the couple of months until its actual release. On April 4th, cartoonist, designer, artist, writer and teacher Art Spiegelman and I will be in conversation at Bard College, NY state. We will talk about comics and MAUS and music and art and being Jewish and life and everything I have ever wanted to ask Art. (Or he will ask anything he's ever wanted to ask me.) Tickets are available now. Please come: It's a big hall and we will be lonely if it echoes.